We were perhaps a little too enthusiastic this fall in our apple picking at a local orchard and our acquisition of interesting squash at our farmer’s markets. Our freezer now contains many bags of applesauce and squash puree. We must now “do something,” as we say, with all of it, meaning use the purees as ingredients. Lately I’ve been working on incorporating the purees into nutritious (low sugar, high protein, whole grain) quick breads. On my doctor’s recommendation, that quick bread also needs to be gluten-free. Increasing appearances of the phrase “gluten free” on restaurant menus and product labels are noble efforts to accommodate the needs of people who have celiac disease or other dietary sensitivities to gluten. Baking without gluten is a challenge, as gluten is what gives wheat dough its elasticity and allows yeasted wheat bread to rise. The internet makes gluten-free baking more accessible by the day, but I haven’t yet found someone else’s recipe that really does what I want, so I’ve been working on my own. I’m fairly pleased with the latest result (below) and thought I would use the occasion to give you a brief evolutionary history of gluten and the botanical family that makes it: the grasses. Some grains (in beakers in a lab). Top row, from left: millet, steel-cut oats, bread wheat. Middle row: pearl barley, red rice, kamut wheat. Bottom row: brown rice, wild rice, black rice. The story of the evolution of wheat will have to wait for another day, but it appears that the hybridization events that produced modern bread wheat conferred to its genome the means to produce PGCs from multiple ancestral species and lots of it, making modern bread wheats the worst gluten offenders. The phylogeny below includes selected representatives from the major subfamilies in the grass family. Phylogeny of the grass family (Poaceae) with selected representatives from the major tribes and subfamilies. Food plants (and bamboo) from each subfamily are labeled on the right. The “O” on some of the branches indicates the shift open habitats, the key evolutionary innovation that allowed grasses to currently cover 20% of the planet. The bold lines indicate clades using the C4 photosynthetic pathway, a topic for another time. The last common ancestor (LCA) of some grains are indicated with arrows. Phylogeny from Kellogg (2001). I have indicated on the figure the grains and a few other interesting grasses next to their subfamilies. Incidentally, we use the botanical definitions of “cereal” and “grain,” which are species from the grass family and the fruits (containing the seeds) of those species, respectively. Colloquially and commercially, the terms also refer to species that are not grasses with fruits and/or seeds that are used in the same way as grass family grains. Common examples include buckwheat, quinoa and amaranth, which are eudicots from families in the order Caryophyllales (See our food tree of life for phylogenetic contextualization). Buckwheat (Fagopyrum esculentum) is in the family Polygonaceae along with rhubarb and sorrel. Quinoa (Chenopodium quinoa) and amaranth (Amaranthus spp.) are both in the family Amaranthaceae, along with beets, chard and spinach. All of these non-grass-family pseudograins by definition and biologically are gluten-free. But back to our grass phylogeny. Notice that oats (Avena spp.) are the grain most closely related to the Triticeae in the subfamily Pooideae (the last common ancestor (LCA) of wheat and oats is labeled on the figure with an arrow). Though the PGC of oats is not labeled gluten, some researchers think that its genetic code contains some of the offending sequences found in the genes that code for medically problematic regions in gluten, which helps explain from the botanical side of the medical issue why some celiacs can handle oats and some can’t. 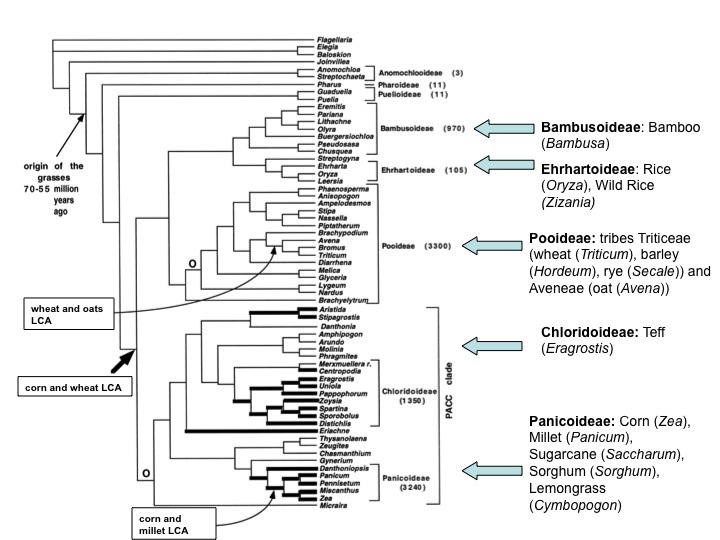 So you can point to the wheat-oat LCA as a putative evolutionary origin of the particularly problematic PGCs. Even though the oat PGC lacks the gluten brand, you still might see packages of oats that are “certified gluten free.” This label means that the oats are free of contamination by Triticeae grains. Contamination of oats and corn happens because stray plants or seeds from Triticeae species tend to frequently pop up in fields of non-Triticeae grains or in mills where the seeds are processed or flour is ground. As we move away from oats to grains more distantly related to wheat on the phylogeny, I don’t know whether phylogenetic distance correlates well with difference in PGC, but that’s a decent hypothesis. The offensive gene sequences still present in oats have become innocuous by the time we get to rice (Oryza spp.) and wild rice (Zizania spp.) in subfamily Ehrhartoideae, the grains next most closely related to the gluten-containing Pooideae, followed by corn (Zea sp. ), millet (Panicumi sp. ), sorghum (Sorghum sp.) and the fun bonus grasses sugarcane (Saccharum sp.) and lemongrass (Cymbopogon sp.) in the Panicoideae. The most distantly related grain to wheat is teff (Eragrostis tef) in the Chloridoideae. Awesomely, the name of the genus Eragrostis means “lovegrass,” derived from Greek eros (love) and agrostis (grass). I do indeed love this grass from the Ethiopian highlands, which is also the geographic origin of coffee, but that too is obviously a story for another a day. The name “teff” is derived from a word in one of the languages native to the region meaning “lost,” perhaps in reference to the extremely small size of this tiniest of the grains. If one of the 1mm-diameter seeds were to fall, it would be lost. Teff is the flour in the Ethiopian staple injera, a wonderful spongy sourdough flat bread. Shauna Ahern at the excellent gluten-free blog Gluten-Free Girl and the Chef says about teff: “Nutty in flavor and fine in texture, teff actually makes an excellent baking flour.” I agree and am pleased with its performance in this latest iteration of the “do something with it” quick bread. This bread is only mildly sweet. You can eat it as is, with butter, use it in a bread pudding, or dress it up with stewed apples and whipped cream or ice cream. Use blackstrap molasses for a dark bread with noticeable molasses flavor, or use sorghum molasses or agave syrup for a lighter bread with more subtle flavor. The ground flax or chia is not optional. These seeds become gummy when wet (another botanical topic for another time), adding back some of the gluten-like elasticity to the dough. If you can only find whole seeds and not the ground meal, just grind them at home in your food processor, blender or coffee grinder (or mortar and pestle, if you prefer). They don’t have to be particularly finely ground to become sufficiently gummy. Preheat oven to 350 and butter a bread pan. Stir flaxseed into puree. Cream together butter, molasses and eggs until well mixed. Mix together dry ingredients. Combine everything quickly and put batter into the bread pan. Bake at 350 for about an hour, until a toothpick comes out clean. Turn out of loaf pan immediately onto cooling rack. Kellogg, Elizabeth. 2001. Evolutionary History of the Grasses. Plant Physiology 125: 1198-1205. This entry was posted in Recipes, Uncategorized and tagged apple, glutelin, gluten, gluten free, grain, grass, Jeanne L. D. Osnas, monocot, phylogeny, Poaceae, prolamin, pumpkin, quick bread, recipe, teff, Triticeae, wheat. Bookmark the permalink. I recently had labwork done for gluten-associated cross-reactive foods & foods sensitivity, and found out I’m also reacting to corn, which was something I suspected. I was surprised to find out I have to avoid sorghum, millet, hemp, teff and tapioca. Looking at your chart, most of them have something in common with corn. Good luck, Peter. It’s true that many plant proteins can cause allergies. Sorghum, millet, teff and corn are grasses. Tapioca and hemp, however, are not. I knew tapioca was not a grass, but I *cough* assumed hemp was- I planned on looking it up, just got lazy for the note. Excellent intelligent article, thank you. It’s so good (at last) to find a site dealing with gluten intolerance issues, with such clear explanations re the phylogeny laid out to see. Added to my “favourites” bar, I shall be coming back to read more.